According to Medline Plus on-line medical dictionary, bronchopulmonary dysplasia (BPD) is a chronic lung condition that is caused by tissue damage to the lungs. It usually occurs in immature infants who have had severe lung disease at birth, such as respiratory distress syndrome, and have needed to receive mechanical ventilation and supplemental oxygen as treatment for more than a few weeks after birth. The delicate tissues of the lungs can become injured when the air sacs are over-stretched by the ventilation or by high oxygen levels. As a result, the lungs become inflamed and additional fluid accumulates within the lungs. BPD is marked by inflammation, exudates, scarring, fibrosis, and emphysema, and most commonly presents itself in pre-term infants to 21 days post natal. The pathophysiology of BPD is multifactorial and is not yet fully understood. However, on the site E-Medicine it is stated that a variety of toxic factors contribute to the formation of BPD by injuring the small airways, eventually resulting in a reduction of the alveolar surface area. This affects gaseous exchange which further compromises blood oxygenation. BPD is believed to be a disease of scarring and repair. Even though the exact pathophysiology is still unclear, 4 stages in the development of BPD have been identified. In stage 1 (1-3 days), the pathologic appearances of BPD are identical to those of respiratory distress syndrome where there is not enough surfactant in the lungs. Surfactant helps to lower surface tension in the airways and this helps keep the lung alveoli open. It involves the presence of hyaline membranes, atelectasis, vascular hyperemia, and lymphatic dilatation. In stage 2 (4-10 days), lung destruction resulting in ischemic necrosis of airways occurs due to stretching of the terminal bronchioles. Immediate reparative changes in the lungs as well as bronchiolar obstruction are also seen in this stage. Hyaline membranes can persist into this stage and emphysematous coalescence of the alveoli is seen. Stage 3 (11-20 days) involves progressive repair of the lung, with a decreased number of alveoli. There is compensatory hypertrophy of the remaining alveoli, and hypertrophy of bronchial-wall muscle and glands. Regenerating clear cells are seen, along with exudation of alveolar macrophages and histiocytes into airways. Airtrapping, pulmonary hyperinflation, tracheomegaly, tracheomalacia, interstitial edema, and ciliary dysfunction may also be present. In stage 4 (>1 month), emphysematous alveoli are seen. Chronic lung damage eventually causes Pulmonary hypertension (caused by thickening of the inner-most lining of pulmonary arterioles), and results in cor pulmonale. Fibrosis, atelectasis, a cobblestone appearance due to uneven lung aeration, and pleural pseudofissures are often seen. Marked hypertrophy of peribronchiolar smooth muscle is present. According to Medline Plus, BPD occurs in severely ill infants who have received high levels of oxygen for long periods of time or who have been on a ventilator during treatment for respiratory distress syndrome. It is more common in infants born early (premature) whose lungs were not fully developed at birth. 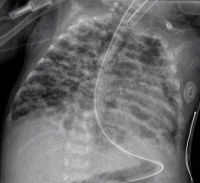 It may also occur as a secondary problem for the neonate attached to a mechanical ventilator. They are often more susceptible to respiratory infections such as influenza and pneumonia. The infection is worse in children with BPD than in normal infants. Pulmonary Edema, an excess fluid build-up in the lungs, which decreases air entry into the lungs and infants cannot breathe which results in respiratory distress. Infants with a history of BPD may also develop a rare complication in their circulatory system known as pulmonary hypertension. This occurs when the blood vessels carrying blood from the heart to the lungs become narrowed, resulting in high blood pressure. Infants with BPD have stunted growth and have problems gaining weight. They also tend to lose more weight when they are sick. Premature infants with severe BPD also have a higher incidence of cerebral palsy. It is difficult to determine whether or not a baby has bronchopulmonary dysplasia (BPD) before he or she is about 14 to 30 days old. By this time the baby should be showing improvement in breathing problems, instead the condition seems to be getting worse and the baby requires more oxygen and assistance from a ventilator. BPD is confirmed as a diagnosis if the infant requires additional oxygen and continues to shows signs of respiratory distress after 28 days of age. A number of tests are also conducted on newborns with breathing problems to make sure they diagnose their condition correctly. Blood tests. Blood samples are checked to see whether the baby has enough oxygen in his or her blood. Chest x-rays. It shows larger areas of air and changes from inflammation or infection. It also shows areas of the lung that have collapsed and may help confirm that the lungs aren't developing normally. 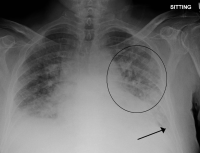 On a chest x – ray, the lung tissue appears spongy. Echocardiogram. The use of sound waves to create a moving picture of the heart. Echocardiogram is used to rule out congenital heart defects or pulmonary arterial hypertension as the cause of the breathing problems. Doctors grade BPD as mild, moderate, or severe, depending on how much extra oxygen the baby needs and how long he or she needs it. During pregnancy, regular check ups with the doctor should be done. Dietary supplements are essential, along with good, healthy eating habits. Avoid smoking, consuming alcohol and taking illegal drugs. It is vital that the mother-to-be is controlling any chronic diseases (e.g. Diabetes, Hypertension etc.) with proper medication. Mothers-to-be must make sure that they attend to all cuts and bruises as soon as possible to prevent infections and other easily attainable communicable diseases. The baby is usually put on a mechanical ventilator. The ventilator, which is connected to a breathing tube that runs through the baby's mouth or nose into the windpipe, can be set to help a baby breathe or to completely control a baby's breathing. It also is set to give the amount of oxygen the baby requires. With help breathing, the baby's lungs have a chance to develop. The baby is given surfactant to open his or her lungs until the lungs have developed enough to start making their own surfactant. Surfactant is given through a tube that is attached to the ventilator, which pushes the surfactant directly into the baby's lungs. Bronchodilators – Bronchoconstriction and airway hyper reactivity. Diuretics - Pulmonary edema, and removal of extra fluid in the lungs. Steroids - To decrease airway inflammation. Using a radiant warmer or incubator to keep your baby warm and reduce the chances of infection. Ongoing monitoring of blood pressure, heart rate, breathing, temperature and the amount of oxygen in the baby's blood. Monitoring fluid intake to make sure that fluid doesn't build up in the baby's lungs. It must be noted that infants with Bronchopulmonary Dysplasia are cared for in the Neonatal Intensive Care Unit. Changing positions helps to mobilise secretions out of the small airways. Suctioning and mucolytics may be an option for tenacious sputum and when the child has difficulty coughing. ↑ Merck Manuals Online Medical Library. 2003. Bronchopulmonary Dysplasia (BPD). Retrieved on 11/04/2009 from: http://www.merck.com/mmhe/sec23/ch264/ch264l.html.